Tomorrow is pi day (March 14 = 3.14) so in our mathematically inclined (nerdy) house that means we invite friends over and eat pie. 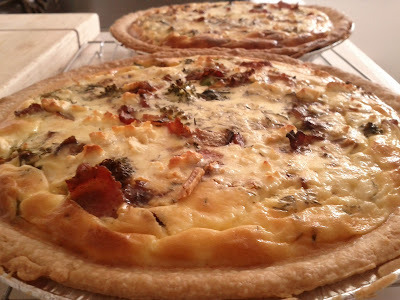 This year I'm bucking the trend and making quiche, an egg pie with goodies. I bought frozen pie crusts because Ladypants didn't have time to make any of her own for me, and I dislike making dough. They are the right shape even if they aren't as tasty as they could be, and besides, it's really all about the filling. I chose caramelized onions, Bacon, spinach, broccoli and feta cheese. Start by preheating oven to 400 and frying the bacon and the onions because they take the longest. If you are using frozen pie crusts, you should have them out of the freezer at this point. 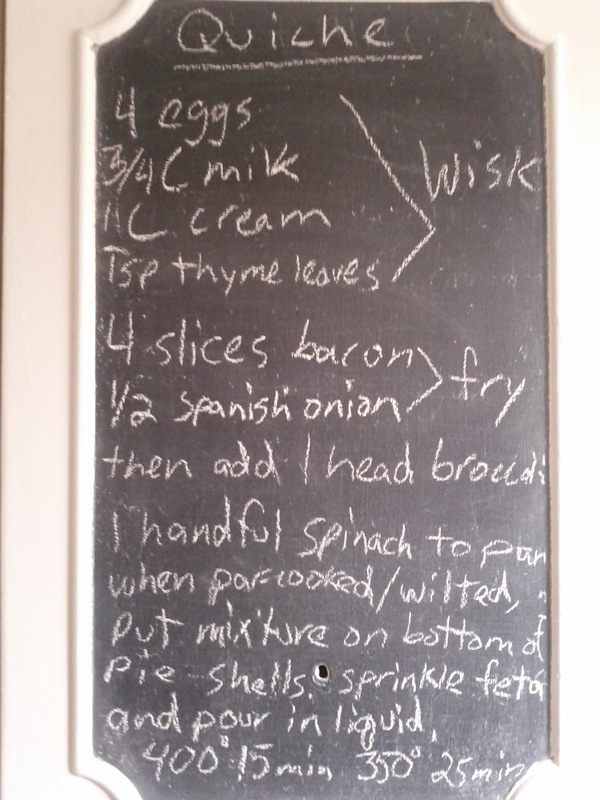 When the bacon is crispy and onions look golden brown, add the broccoli and a big handful of spinach. Cook it just until the broccoli turns bright green and the spinach is wilted. Let it cool a bit while you make the custard. Season everything to taste. 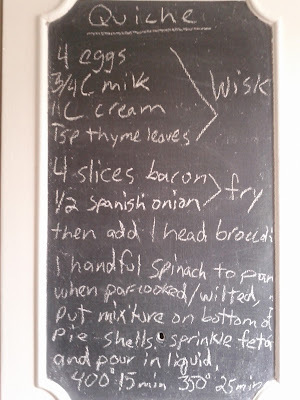 Wisk 4 large free range, grain fed and generally pampered chicken eggs. Add 3/4C milk and 3/4C cream and thyme leaves. On the chalkboard it says 1C cream, but I had a quarter cup of liquid leftover, so don't bother. Mix it well. Add the chunky mix to the bottom of 2 pie crusts, crumble as much feta cheese as you want and pour the well mixed creamy stuff on top. Bake for 15 minutes, then reduce the temperature to 350 for the next 25 minutes. Let them set up a few minutes out of the oven, and eat these great tasting pies.